It's always fun til someone loses an eye. I always knew Danger Girl would be the first broken bone. And, if the doctor hadn't chosen to super glue her foot together when she was three, Danger Girl would have been the first stitches, too. She also holds for first dislocation and is the overall winner of most ER visits. In fact, she has more ER visits than all of the other kids combined. A listing of the ways she has managed to hurt herself would make for interesting reading. How many kids can boast to having a nostril sliced clean through by walking in front of a swing? Or having a foot impaled on a toy after jumping off a dresser in an after bedtime Olympics? Surprisingly, the "don't run with that in your mouth" injury goes to Little B. Lacerated uvulas bleed like you wouldn't believe. Danger Girl and Leelee are continuing a family tradition curse of older sisters breaking bones of younger sisters. I swear I was a good kid. These genes are totally coming through D's side of the family. One and a half inch thick solid oak doors pack a mean punch, even more when slammed by an irate older sister. I'll spare the actual injury pictures. It was pretty gnarly. I thought she needed stitched. Then I looked at the under side of her finger which had turned an unnatural purple color. It didn't take an X- ray to figure out it was broken. She thought it was pretty darn cool by the end of the night. The good news from the orthopedic surgeon is she doesn't need surgery. She could have used stitches, but that would involve ripping off her entire fingernail to get to where the worst of it is located and he didn't want to put any more trauma on her. 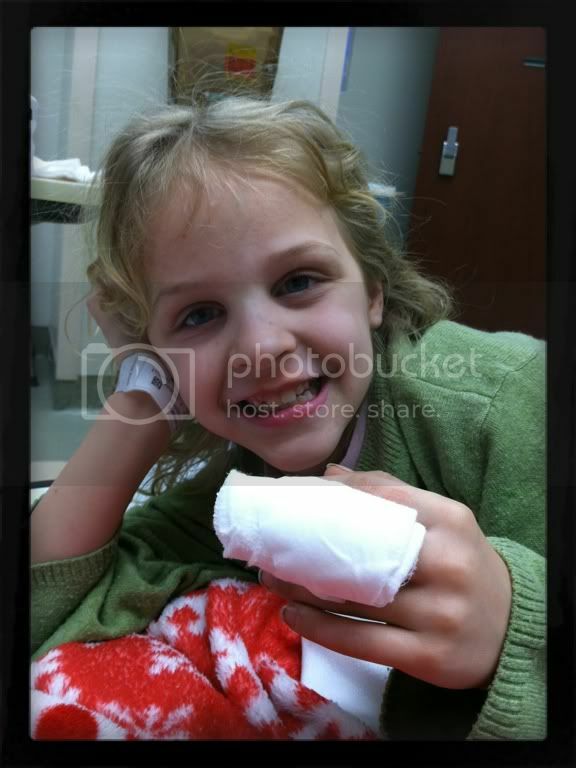 Danger Girl also got a proper splint but is far more proud to show off her humongous finger wrap. That's awesome that she takes it like a champ - who wouldn't love that particular finger to show everyone? Did they let you keep the x-ray? Oh that hurts thinking about that type of injury! Her injuries will be fun to tell her kids about some day. My daughter still laughs at the story my dad tells about when I fell out of a tree and hit my nose on a giant root. I'd never seen a bloody nose before and my brother and I both cried because we thought I was going to die! LOL Hope she heals quickly!